All the Project Officers and District Educational Officers in the state are informed that the School. 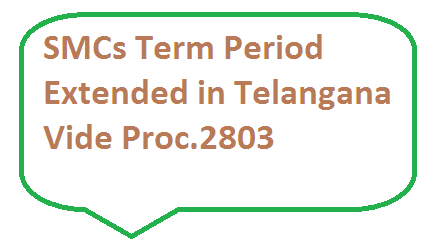 Management Committees (SMC) are not in existence as the term of the SMC has come to an end by 28.06.2015 as per the ref, cited above. The to SMC Bank Accounts of Schools are being maintained jointly by the Chairperson of School Education Committee and Head Master of the School (Member Convenor) concerned. Therefore, the operation of SMC bank account of schools is not possible in the absence of the Chairperson of School Management Committee, Further, construction of new toilets and repairs to dysfunctional toilets has been taken up in schools on large scale and funds were released to the SMCs to meet the expenditure on thus item. Construction of toilets is the responsibility of SMCs and the existence C is very much required till all toilets are completed and accounts settled. Procurement of uniforms to school children is also under progress and funds are to be released to SMCs shortly. In view of the above, it is decided to extend the term of SMC till 31.08.2015. therefore, the Project Officers and District Educational Officers are requested to issue necessary instructions to the concerned for continuation of SMCs till month.